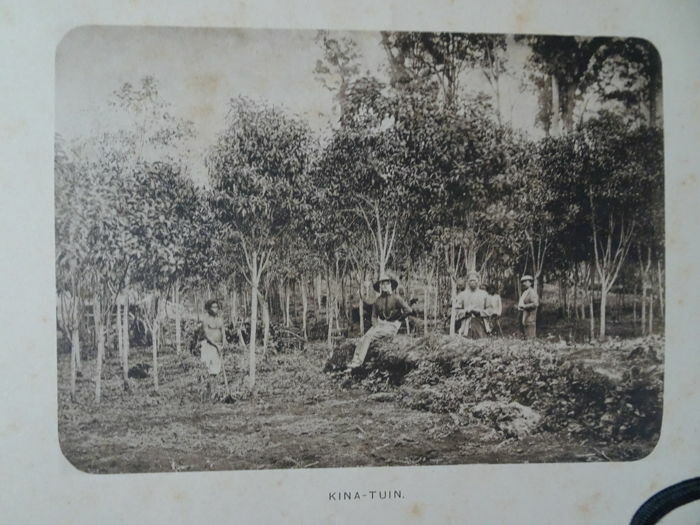 KLOKKE, A.H., Langs de rivieren van Midden-Kalimantan. Cultureel erfgoed van de Ngaju en Ot Danum Dayak / Along the rivers of Central Kalimantan. Cultural herotage of the Ngaju and Ot Danum Dayak, Leiden 2012 (ed. : C.Zwartenkot Art Books). Soft cover 21 x 24 cm 176 pag with around 200 photographs. Text both in Dutch and English. Von Wyss-Giacosa, P. & Isler, A., Aufschlussreiches Borneo. Objekte, Fotografien und Dokumente des Schweizer geologen Wolfgang Leupold in Niederländisch-indien 1921-1927, Zürich 2011(Völkerkunde Museum der Universität Zürich // ISBN: 9783909105540). Hard cover 25 x 21,5 cm. 155 pages with 67 photographs and around 50 photographs of ethnographic objects. text in German. 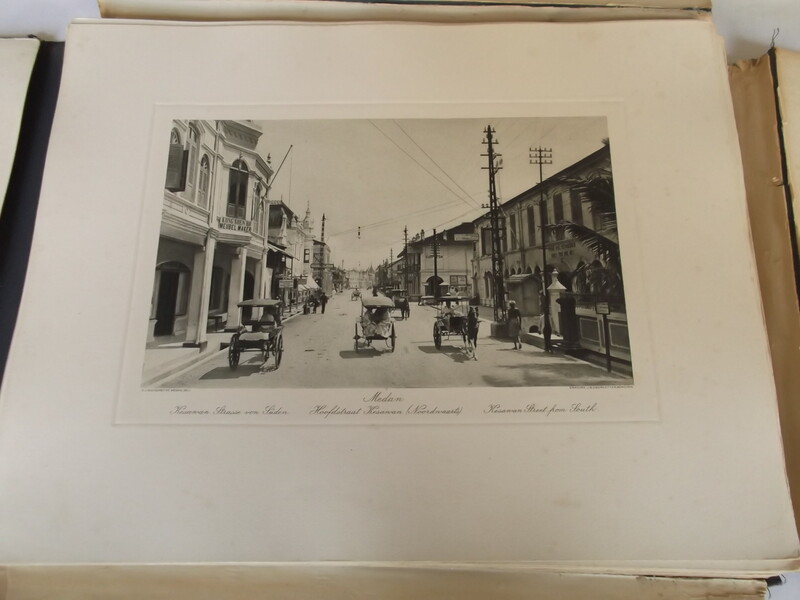 MERRILLEES, S., BATAVIA in 19th Century Photographs, Singapore 2010. Hard cover 26,5 x 28,5 cm. 282 pag. with 154 photographs. KNAAP,G. , CEPHAS, Yogyakarta Photographer in the service of the Sultan, Leiden 1999. Hard cover[oblong] 23,5 x 27,5 cm. 136 pag. with ca. 100 full-page photographs. ISBN 9067181420. "During the nineteenth century the art of photography in the Netherlands Indies, now Indonesia, was mainly in European hands. Gradually, members of other ethnic groups moved into the field. Among indigenous ethnic groups, the pioneer was the Javanese Kassian Cephas (1845-1912). From the early 1870s Kassian Cephas was photographer to the court of the Sultans of Yogyakarta. As such he was responsible for many portraits of the royal family, in particular during the reign of Sultan Hamengkubuwana VII. Besides portraits of the royal family, Kassian Cephas documented theatrical performances and ceremonies at court. Apart from a biography of Kassian Cephas and his son and successor Sem Cephas (1870-1918), this book offers a selection of 98 pictures of the exquisite work of these photographers, drawn mainly from the photographic collection of the Koninklijk Instituut voor Taal-, Land- en Volkenkunde (KITLV). This selection introduces the reader to a world of royal dignity, gracious dancers, shadowy town views, impressive temple ruins and the mysterious Indian Ocean coast." Boerhaave Museum, De reizende astronoom. Nederlandse sterrekundige expedities naar de Oost en West(free transl. : The travelling astronomer. Dutch astronomy expeditions to the East and the West). Leiden 1993. Booklet soft cover 26 x 21 cm. 32 pages, short article on expeditions to Réunion(1874) and the Dutch East Indies(1901). Text in Dutch. Cover (left bottom) slightly damaged because of sticker removal. Een propagandist van het zuiverste water. VANVUGT, E. , Een propagandist van het zuiverste water. H.F.Tillema(1870-1952), Amsterdam 1993. Softcover 20 x 25 cm. 168 pag. met zwart-wit foto's. 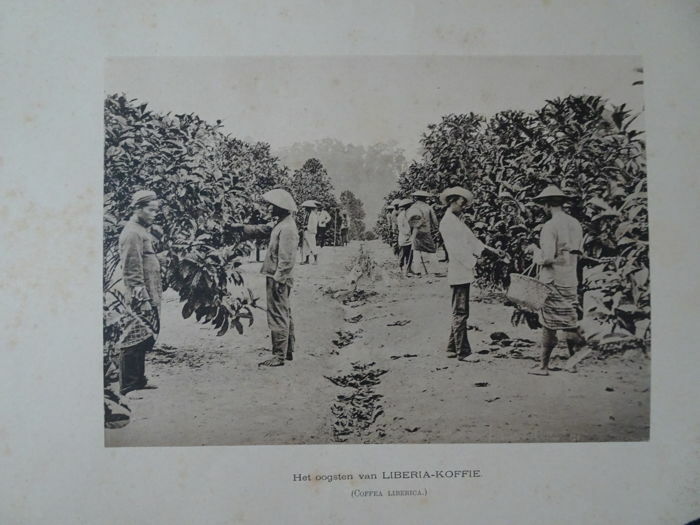 H.F.Tillema collected and made realistic photo's during his stay in Dutch East Indies. His photo's are grouped on different realistic themes, like: the military, housing, workforce & supervisors, etc. MERRILLEES, S., Groeten uit Jakarta. Ansichtkaarten van een hoofdstad 1900-1950(tr. : Greetings from Djakarta. Postcards from a capital1900-1950), Alphen a/d Rijn 2012. Hard cover 27 x29 cm. [oblong] 248 pages with 450 postcards. Text in Dutch. Van Den Berg, N. & WACHLIN, S., Het Album van Mientje. Een fotoalbum uit 1862 in Nederlandsch-Indië[ transl. 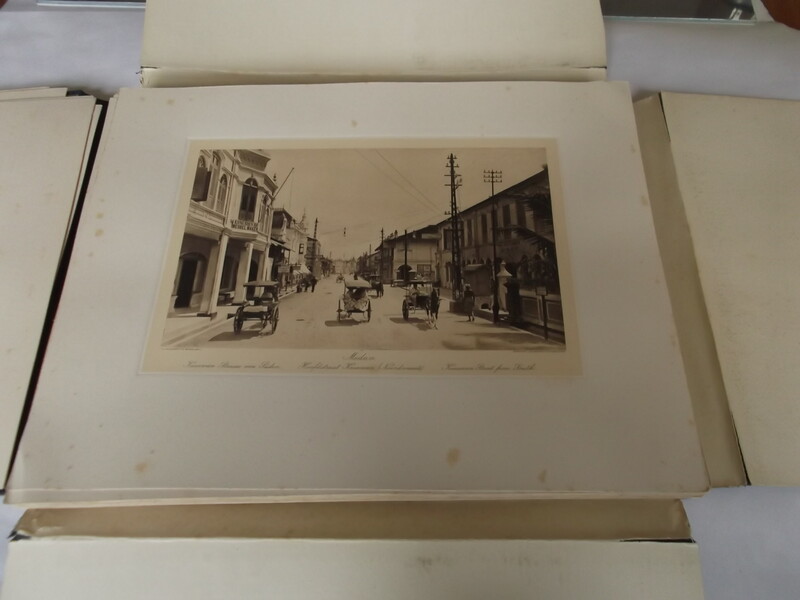 : A photo album dated 1862 in the Dutch East Indies] , Bussum 2005[publ. : Uitgeverij Toth // ISBN9068683853]. Hardcover 25 x 23 cm. 248 pages with 100 full-page photographs. Text in Dutch. Museum stamp on title page. HAKS, L. & ZACH, P., Indonesia Images of the Past Photographs of Jean Demmeni, Singapore 1987. Hard cover 25 x 28 cm. [oblong].120 pages with around 100 photograps. Good copy. "Jean Demmeni (1866-1939) born in Padang Panjang(West-Sumatra) son of aFrench father and an Indo-European mother. His father served in the DE Indies Army in the 1870s during the Atjeh wars. Jean served also as non-commissioned officer who entered the D.E. Indian Army in 1888; later he was transferred to the Topographical Service. In 1896-97, and 1898-1900 he accompanied the expeditions of Nieuwenhuis to Borneo, in 1908 he took part in a topographical survey of Krakatau Island, and was the first to reach the summit; in 1909-11 he was a member of the Exploration in Dutch N. New Guinea, mainly as photographer and mentor of the Dyak coolies. 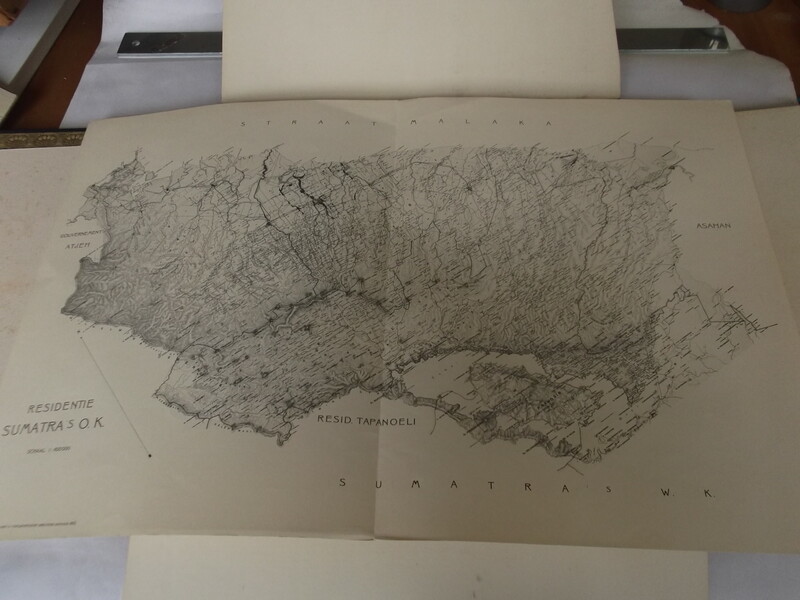 Employed by the Topographical Service at Batavia, 1911-20; when pensioned off in the latter year, he continued work in the Central Office of Dactyloscopy." THEUNS-DE BOER, G & ASSER,S. 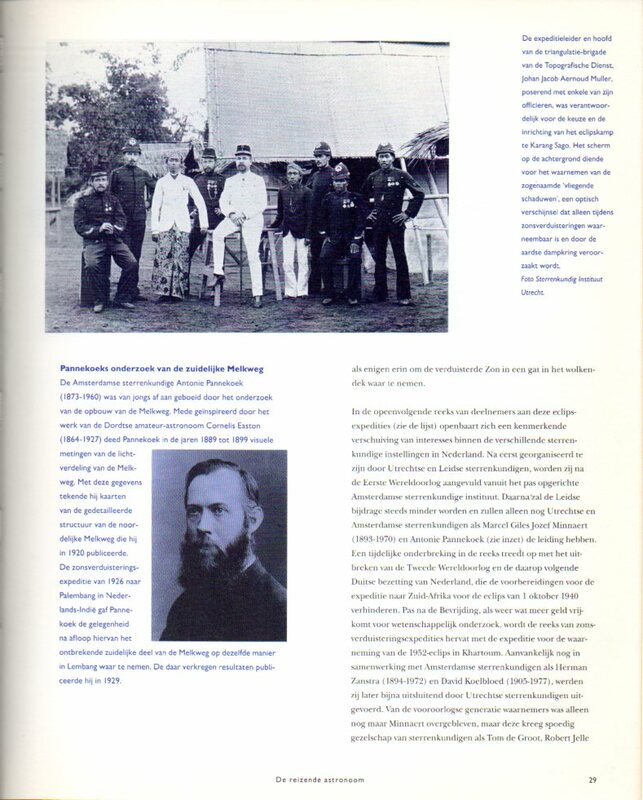 & WACHLIN,S., ISODORE VAN KINSBERGEN(1821-1905). Fotopionier en theatermaker in Nederlands-Indië, Zaltbommel 2005. Hardcover 24 x 28 cm. 295 pag. met 350 zwart-wit afb. Text in Dutch and English. 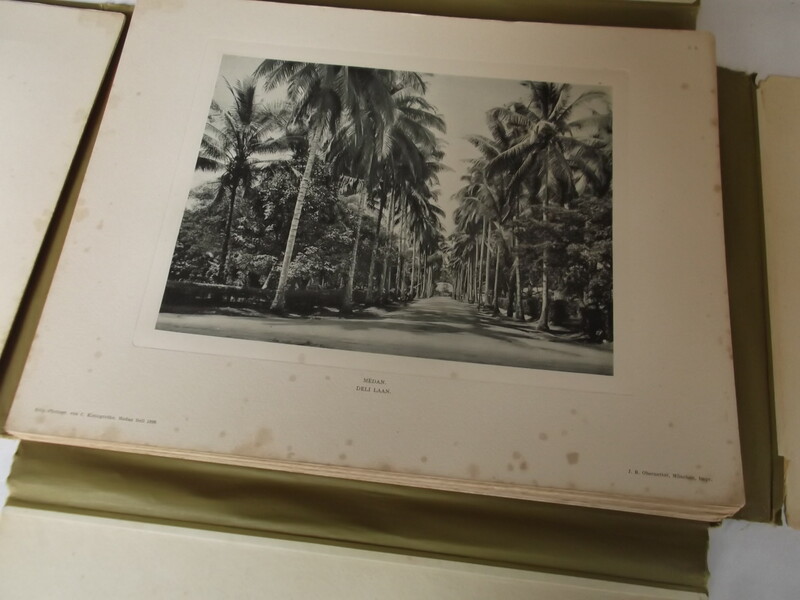 Content: contrary to the wear of the portfolio are the helio-engraved photographs and the title page in good condition. Leaves 52 and 53 have a very small hole. Here and there is sign of very slight foxing in the margins. The helio-engraved photographs are amazingly clear. Inhoud: in tegenstelling tot de slijtage van de map verkeren de fotogravures en het titelblad in goede staat. Fotogravures 52 en 53 hebben een klein gaatje. Hier en daar is in de marges heel licht wat verbruining te zien. De fotogravures zijn verrassend helder en schoon. Portefolio with 60 collotypes depicting "Koloniale voortbrengselen ten dienste van het onderwijs[free transl. : Images of colonial agricultural products to be used in education] ". The portefolio contains 5 files in wraps[loose]. Each file containing 12 collotypes. In total 60 collotypes. Files 1 and 2 have been published in 1895. On the wrap is written "not for sale". File 3 is published in 1896. File 4 has no publication date. File 5 is dated 1901, the collotypes of this file were made on base of the photographs made by the "Vereniging van Amateur-photographen te Batavia[The Association of Amateur-photographers in Bartavia]. 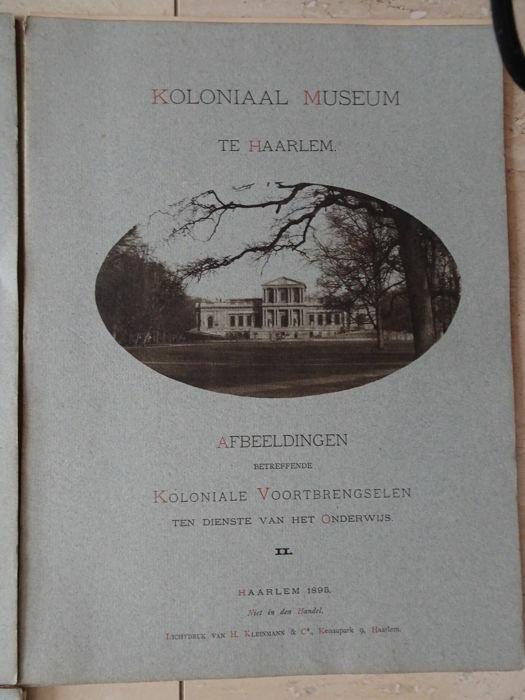 The files were printed by "" Lichtdruk van H. Kleinmann en Co" and published by the former "Koloniaal Museum in Haarlem". This is a first edition. Size of the collotypes: 32,5 x 24,3 cm. The collotypes in file 1 show some browning. Reasonable to good copy. Von Wyss-Giacosa, P. & Isler, A., Memori dari Kalimantan // Memoires from Borneo. Photographs by the Swiss geologist Wolfgang Leupold, Zürich 2013(Ethnographic museum of the University of Zürich // ISBN 9783909105564). Soft cover 24 x 21 cm. 207 pages with 167 full-page photographs. Text in English and Bahasa. LOUREIRO, J., Postais Antigos e Outras Memórias de Timor, Lisbon. Hard cover size: 30 x 24 cm. 152 pag. with 254 postcards/photographs in colour (dating from 1910 to 1970). Text in Portuguese. ZWEERS, L., Strijd om Deli. Verboden foto’s van de Eerste Politionele Actie op Sumatra // Battle of Deli. Forbidden photographs of the battle actions on Sumatra, Zaltbommel 1997. Soft cover 22 x 22 cm. 96 pages with 60 photographs.Library copy with only some writing and a stamp on the title page. Good copy.